When cropping my image, I’d use the Rectangular Snip and highlight the emulator and try and get is accurate as possible. If the chrome of the emulator ever crept in, I’d adjust it in GIMP and try and ensure it remained at a resolution of 480 x 800. This got a bit tedious at times. Solution? 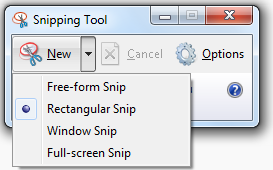 Use the Window Snip option underneath :D. Select that, click on the emulator screen and you have a 480 x 800 perfectly cut screenshot! As a bonus, the emulator chrome is not included, so your app won’t be rejected from the marketplace for that reason. Don’t forget to set your emulator size to 100%! Am I the only one who didn’t realise this? If not, hopefully it will save other people time :). 6 Responses to Creating Emulator Screenshots the VERY Easy Way! I don’t understand why this capability is not present in the OS like it is on iPhone. Non-developers need to do screen shots, for blogging and to supply technical feed back to us developers… Depending on the emulator is a poor solution. Taking screenshots from the device is a common request, so hopefully it becomes available in an update.